JaspersoftETL is a Java code generation tool designed to load your operational data into a data warehouse and get it ready for reporting and analysis. Jaspersoft OLAP takes advantage of aggregate tables and an in-memory cache to speed up queries. If you're running a nightly job to load the DW, it's a good idea to clear the OLAP cache at that time, otherwise your users will not take advantage of new data. Login with superuser privileges and display the OLAP Settings page. In the OLAP Settings panel, click Flush OLAP Cache. Restart the application server instance. 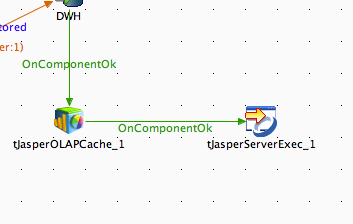 Another useful thing to do would be to use the tJasperServerExec plugin to re-populate the cache.